If the "progressive jackpots 'n' fruit" salad of Funky Fruits by Playtech or Microgaming's jungle-themed Big Kahuna have left you wanting more punch for your punch, take a look at Play n Go's latest offering. 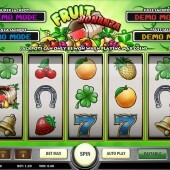 In fact, if their app-based slot, Ninja Fruits, was anything to go by, Fruit Bonanza should have been a blast. Sadly, it's not exactly strawberries and cream, more soggy bananas and rotten apples. 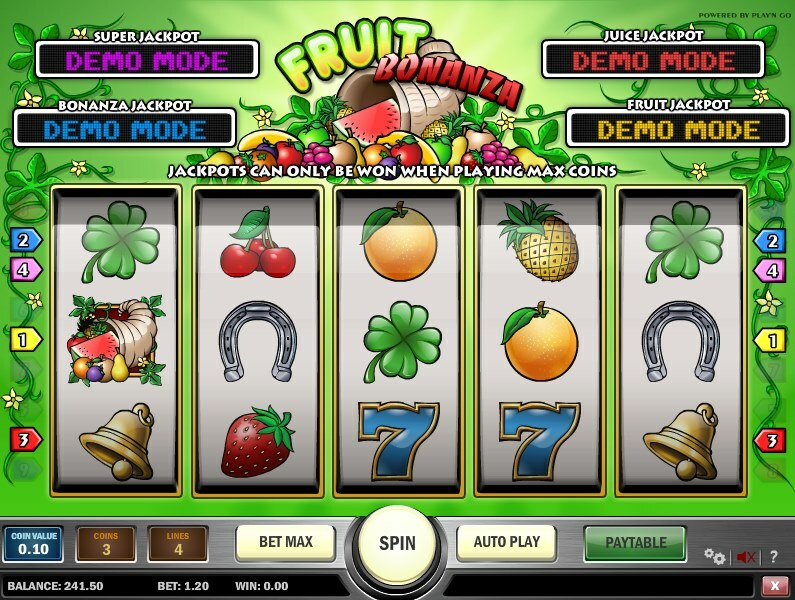 A progressive slot in the mould of the old-school fruities, Fruit Bonanza is a 5 reel, 9 pay-line game with all the symbols you'd expect from an old-school slot: cherries, pineapples, Lucky 7s, horseshoes, strawberries, bells and oranges all adorn the reels. The noises are suitably casino--like, with lots of one-armed bandit sounds and plinky-plonky music. So far, so retro. But that's not enough for some slots fans. How about some jackpots? This game has not one, but four progressive jackpots! How do you get your hands on those? Well, simply get five 'cornucopia' icons, bulging with fruit, across the reels and you'll win the Bonanza Jackpot (or the Super Jackpot on pay-line 9). Jackpots then decrease with fewer icons: four gets you the Juice Jackpot, and three wins you the Fruit Jackpot. As with most progressives you'll have to bet the maximum, but with four jackpots on offer there's no reason to take a punt. Two or more mixer blade Scatters anywhere on the reels wins you a prize but sadly there is no bonus feature to be activated. So, with old-school charm and the temptation of big jackpots, does Fruit Bonanza deliver? Not quite, even for a sucker for the old-style games like me. The extra Wilds of something like Big Kahuna or even Microgaming's African-themed slot, Mega Moolah, probably make them better places to deposit your hard-earned bankroll. If only Play n Go had thrown in another couple of touches. Shame.